Since posting an early-May update on the player likeness lawsuit being faced by the NCAA, CLC, and EA Sports another piece of news has dropped and it relates to an admission by EA on how they’ve created players in the NCAA Football and NCAA Basketball franchises. Strauser worked with EA from 1995-2011 and became Executive Producer on Madden NFL (08,10,11), NCAA Football (08, 09, 10), NFL Head Coach, and briefly NBA Live in the early months after the franchise moved to the Tiburon studio. This isn’t exactly the “smoking gun” for the case as discussion around player replication through internal emails between the NCAA and EA has been entered as evidence. It does however further establish the way EA has approached creating players for the NCAA games and backs them into a corner in attempts to explain the rights they have to do just that. One avenue will be arguing First Amendment rights which has already worked in a few other cases with the Supreme Court having determined “expressive works of art” are not subject to judgments based on name or likeness. EA will likely need to argue they are legally doing nothing wrong and not that they aren’t basing in-game characters on real-life players. Recent uncovered emails have shown that NCAA representatives were well aware that players in games were based off real-life players. At one point the NCAA and EA had nearly reached an agreement to have actual player names included in the products. The EA Locker / Roster Share feature was a fallback option. With momentum clearly on the plantiffs’ side NCAA reps have begun to publicly express concern over the future of collegiate sports. This consolidated case in California looks as though it will be going to trial and ultimately be the determining factor of how the NCAA proceeds in the future handling broadcasting rights, merchandising, and video games. 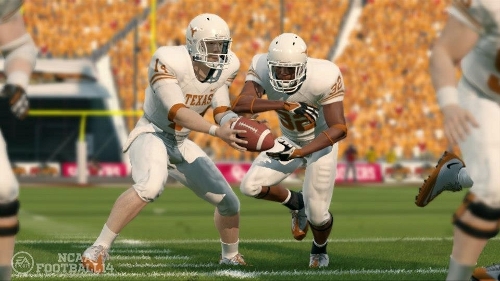 Should a negative result come down, which one analyst has pegged as being a potential loss of $1 billion for EA, it would likely not just end the NCAA Football series but also with it any realistic possibility of college sports games being made in the future. The NCAA is currently seeking to block classification as class action. The trial now is slated to begin June 2014. Appeals following a decision could extend the fight through 2020.